Swiftfax ! 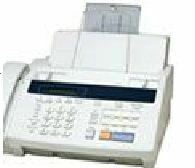 A more simpler, easier and surer way to fax. Since 1994 when SwiftMail launched SwiftFax services in 5 cities namely Chennai, Bombay, Calcutta, Bangalore and New Delhi, Swiftfax has proven itself to be a sound and reliable system. Swiftfax is the most robust and time tested service of its kind offered today and we are the pioneers in India to offer this service. Over the past decade several competitors have come and gone, but only Swiftfax has reigned due to the high quality of service, highest percentage of deliveries and excellent customer service it offers. Swiftfax has been very successful over the past 9 years in its operation and has helped corporates, big and small, to make large amount of savings on their faxing costs and also cut down on the manpower and time spent in faxing. SwiftFax is a system which has been developed 100% in India. This system was initially developed on FreeBSD but was later ported to Unixware. As the system runs critical applications of handling online faxing as well as being a 24 / 7 /375 system, it was only thought fit to run the same on Unixware Servers, which could handle multiple applications and which were much more powerful compared to the other Operating Systems available then. We provide Internet connectivity and other value added services like web based solution, network integration and customized end to end solutions for its customer across India. A decade old company, we have strong presence in all major Indian cities with complete infrastructure, multiple connectivity's and manpower. Founded in 1991 by IOCEE Exports Limited, a 50 year old company & a Government recognized Export House, to cater to the emerging need of Telecom, we have built a strong base and caters to several thousand customers in all verticals of the economy. We are committed to seeking innovative solutions and applications to all aspects of our business; to continually achieving competitive advantage through business process improvement; and to exceeding our customers' expectations.